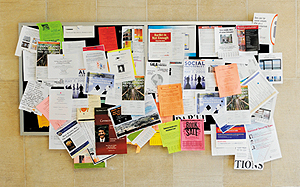 Colored papers pinned to bulletin boards reveal campus buildings’ personalities. For more pictures, view the campus bulletin boards slide show. “Join us in welcoming the full moon!” reads a flyer. “We will be drumming together in the chapel space at Rockefeller.” Divinity School, no question. “Objectivist Club: Come discuss the philosophy of novelist Ayn Rand.” University of Chicago Booth School of Business. Reductive as it may be, the University’s buildings have distinct personalities, and the flyers tacked on their bulletin boards reflect the students, staff, and faculty who inhabit each space. Even the flyers’ arrangements are telling: outside Cobb Hall bright sheets touting a Gregorian-chant choral concert and a “social-justice weekend” compete for space, while at the business school’s Harper Center the postings—a brown-bag lunch on male versus female MBA career paths, a talk by Cereality cofounder David Roth on “innovation activism”—are tacked up neatly and orderly. Granted, many of the same flyers show up at multiple outposts, but taken as a whole, each bulletin board forms a collage celebrating the building’s culture: dressed up or down, professional or granola, concerned with human rights or Kantian philosophy, adaptive immunity or playing mah-jongg, finding an apartment or saving the environment—or all of these things at once. Prospective students may take campus tours and listen to student panels, but perhaps the self-made, ad hoc collections of flyers best advertise the life of the University.